In Slovenia are now many proud owners of iPad. The dilemma whether it is just another gadget – toy or a useful tool remains the same as in all Apple products. On one side almost fanatical supporters of everything bearing the name of Apple on the other hand, those who totally reject Apple. A most interesting programs for the phone also can be obtained for the iPhone are also starting to increase the number of applications that are designed iPad-u and all the other Tablet PC (tablePC) and e-book reader as such. Amazon Kindle. Among the first to offer a tailored look of their applications for the “pill”, is also Google. 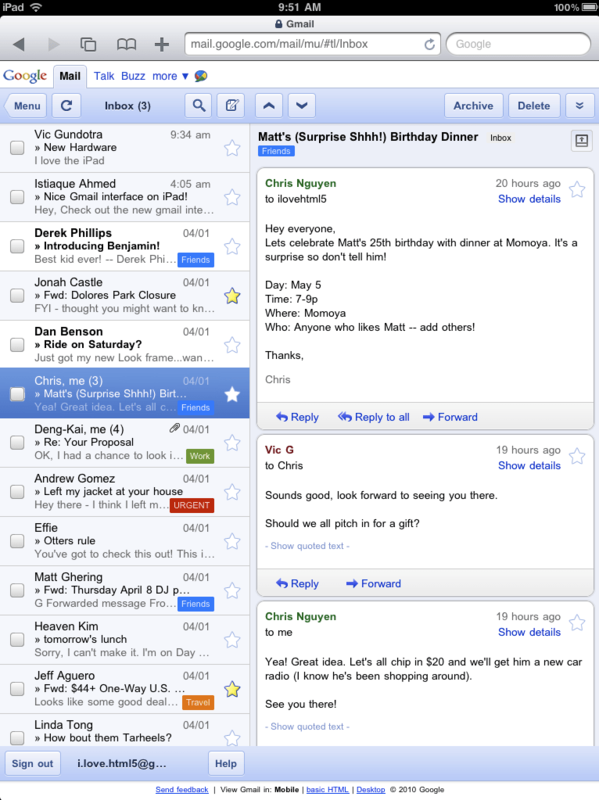 Mobile Gmail for the iPhone and phones adroid HTML5 is fully web-based application. Currently, the App Store is not available for iPad version also, but it can be used as a version for iPhone. Google says that the area is very interested in Tablet PCs, so you can soon expect more of their applications adapted to the iPad. By installing the Firefox browser allowance for User Agent Switcher and change the user agent iPad gives it such a look as it shows the picture above. weakness is that it will then also other sites in the browser to open up the view, which is adapted to the iPad. For the next log into Gmail, it will be seen a tablet display. User Agent Switcher is available in addition to Firefox, but still the Flock, SeaMonkey, and Songbird, and runs on Windows / Mac / Linux environment. Here is described the way the User Agent Switcher, of course, user agent may be a change in any browser. The solution was found at Lifehacker .